Obscurity, observational skills and The Sensorites (1964) | Randomwhoness: a Doctor Who blog by Johnny Spandrell. Sampling stories in random order. Hiding within Doctor Who’s first year is The Sensorites, a story of first disastrous contact between humans and a race of mind manipulating aliens. Like the reclusive aliens of its title, it has done its best to not draw attention to itself. After its broadcast in 1964, it took 23 years to be novelised. It was another 15 years before it was released on VHS and gained its reputation for being stupefyingly dull. When it finally snuck onto DVD another 10 years later, the most noteworthy aspect of it was the accompanying featurette Looking for Peter, in which Toby Hadoke unearthed hitherto unknown info on writer Peter R. Newman. A story which is upstaged by its own featurette is never a good sign. Slow and obscure it may be, but there’s a few things worth noting about this story. For a start, it’s Doctor Who‘s first attempt to show the future of humankind. And it must be said, they don’t come off very well. The humans we meet are hapless victims and delusional murderers. The ones we don’t meet were exploitative money grabbers, we’re told. It’s a gloomy view of our race’s prospects. We’ll have to wait until The Dalek Invasion of Earth before we meet admirable, heroic future humans. 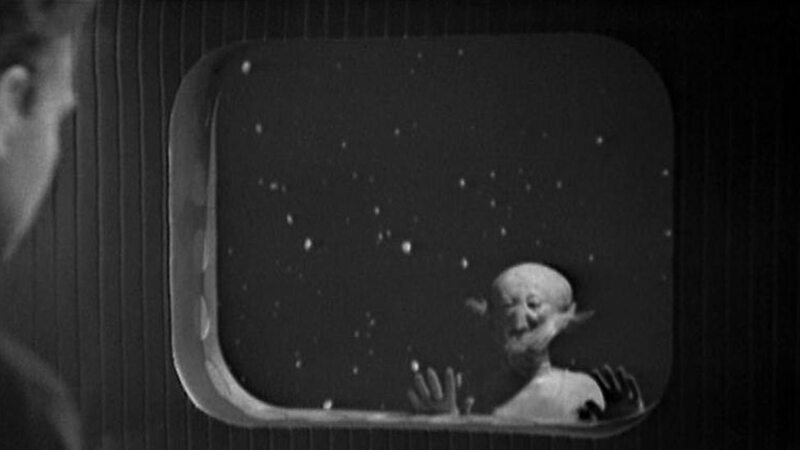 But in general, the Hartnell era is pessimistic about our society’s prospects: mass murder in The Rescue, corrupt dictatorship in The Daleks’ Master Plan, readoption of slavery in The Ark. The future bites, and it starts with The Sensorites. It also features some early attempts to start mythologizing the series. An early awkward sequence sees the TARDIS crew recounting their last adventures in order, like they’re reading from the Doctor Who Programme Guide. But more importantly, the Doctor (a patchy William Hartnell) for the first time becomes a raconteur, name dropping historical figures like Henry VIII and Beau Brummel. It’s now such an established part of his character, but it starts here. Susan (Carole Ann Ford) also drops hints about her and her Grandfather’s past, talking of the planet Esto and of their own planet with its burnt orange skies and silver leaves. Remember, the series is saying, there’s more to these two than we’re showing you, dear viewer. The first two episodes are set on board the Earthlings’ spaceship. The TARDIS crew arrive to find its inhabitants dead (cue loud brass sting! on the soundtrack), then alive, and in both states under mental assault from the Sensorites. In Captain Maitland’s case, they seem to have reduced him to a state of wooden rigidity, unable to speak in anything but a stolid unconvincing manner. Unusually, our heroes decide there’s nothing to be done for the stricken pair, so they head back the the TARDIS to be on their way. Imagine how many other stories might have been cut short this way if the Doctor and co had simply given up and gone home. Time-Flight could have been 15 minutes long. But as they turn around to walk the two metres back to the Ship, they discover its lock has been stolen (loud brass sting!). There are a number of ways in which our heroes might have preempted this. They might have simply glanced towards the TARDIS when the smelt something burning, but despite it being just over there they chose not to. Or they might just have remembered that every time they land somewhere, something prevents them from getting back into the TARDIS and flying away. Don’t think they’re that self aware? How about Ian’s (William Russell) observation later in the story that every time they split up (as they do in nearly every adventure), there’s trouble. He’s been paying attention. Well, except for that lock theft, of course. The first two episodes are full of examples of people taking ages to walk down short corridors, or not overhearing conversations happening right next to them, or cowering from unseen menaces which are clearly within arm’s reach. Lack of space for the sets, I assume, and lack of options directing those hulking old cameras. Whatever the reasons, the result is an awful lot of creeping slowly around the spaceship’s brief corridors. The section where Ian and Barbara (Jacqueline Hill) discover the Sensorites are on board, is particularly static. Perhaps director Mervyn Pinfield was aiming for some Hitchcockian suspense. Or perhaps he just needed to pad out some meagre scripts. But in the middle of these leisurely paced episodes, there’s a remarkable performance by Stephen Dartnell as John, an Earth astronaut driven out of his mind by the Sensorites. Disheveled and wide-eyed, his slightly off camera stares and one-sided conversations combine to produce a performance of palpable madness. It’s actually a shame when his sanity is restored (thanks to an extraordinary spiky hair drying ensemble) and he becomes a regular uninteresting bloke again. Dartnell is a bit of a mystery; this is the second of his two Who roles (he was previous Yartek, Leader of the Alien Voord ™) and after that his CV is very slight. Perhaps if we ever get a special edition DVD of The Sensorites there’ll be a Looking for Stephen featurette. Events liven up slightly when the action (if we can call it that) moves to the Sensorites’ planet. Down there, it’s more traditional Hartnell fare. Like the previous story, The Aztecs, there’s a bad egg among this society, plotting to bring our TARDIS chums down. This is the City Administrator, a kind of disgruntled public servant. Like all the Sensorites, he’s an gnomish little thing, with a beard that extends well up onto his bald head, but he has gruff, truculent tone which helps us remember which one he is. He keeps our heroes busy for a couple of episodes with poison, impersonations and kidnappings and all sorts of villainous incident. But like all the Sensorites in their unforgiving onesies and blank eyelid-less stares, he’s hard to feel anything toward. It’s no wonder when he’s finally brought to justice in the last episode, it’s done off screen. That last episode also reveals who’s been killing the Sensorites; it’s three unhinged members of the Earth crew, who have been poisoning the city’s water supply. As it turns out, they’ve been living out in the wilderness, like soldiers in those tales of military units lost in the jungle, carrying on hostilities because they’ve never heard the war is over. Like the City Administrator, their crimes have been motivated by fear and ignorance. This is a story with bad things done by both sides. If this was story was made ten years’ later, it would have Malcolm Hulke’s name on it. And the Sensorites would be reptiles, natch. In The Daleks and The Keys of Marinus, the previous two science fiction stories this fledgling show produced, the humanoid heroes prevailed over their monstrous opponents. Here, everyone just goes their separate ways, admitting that they all could have behaved better. The humans glide away in their spaceship, the Sensorites retreat back to their Sphere and the TARDIS crew slink away. No-one’s drawing attention to themselves, much like the story itself. But here The Sensorites can claim another first, as the show’s first attempt to show a conflict more complex than just good buys vs. bad guys. In its sleepy way, it’s pioneering. In Looking for Peter, Toby Hadoke calls The Sensorites unloved. But then years later in Gridlock, a snippet of its dialogue gets quoted. And then in Planet of the Ood, the Sense-Sphere gets name checked. And there’s a photo of one in Time Heist, of all things. That’s not bad for an unloved story from 1964. Sure, these are shibboleths to the hard-core fans, but they are also signals that despite its best efforts to hide from us, there are things worth remembering about The Sensorites. NEXT TIME… Two power blocs poised to annihilate each other… It’s time to take a dip with those Warriors of the Deep.